"I'm curious what you thought of these ECGs. They were on a 34 y/o with constant CP x 8 hours-- 1st at presentation, and 2nd 90 min later after Trop returns positive at 1.5 ng/mL. "He had diaphoresis initially at 3 am when it started. "Pain is non pleuritic and there is no radiation. Now improving to 3/10. "He also reported having chest pain with exertion x 2 weeks. Resolved with several min of rest. No identified cardiac risk factors." T-wave inversion in V3; also in III. --With the tachycardia and T-wave inversions V1-V3 and in lead III, with ongoing CP, I would be worried about Pulmonary embolism. --Bedside echo: RV? Look at legs: DVT? --Do CTPA (or at least d dimer, then CT if positive). --If negative, then needs emergent coronary angiogram. The CP with exertion made me think it was ACS/Wellens. I performed a bedside echo and thought the septum wasn’t moving well. However, in retrospect it was likely RV dilatation. Cards took to the Cath lab and no CAD (afternoon). CTA showed saddle PE. IR performed catheter directed thrombolysis. He never reported SOB. I also thought the Troponin was too high for PE. Does the TWI in III make LAD ischemia unlikely? First, the positive troponin confirms that there is myocardial injury, which helps to narrow an otherwise broad differential diagnosis. (The ECG findings are quite nonspecific until you have definite evidence of myocardial injury, at which point ACS and PE go to the top of the list). 1. Chest pain persists with T-wave inversion. Wellens' is a pain free state. That is to say that T-wave inversion in ACS is significant when it is a post-ischemic state, after reperfusion. That is why Wellens' is a pain free state. When there is persistent pain with T-wave inversion, think of other etiologies. Furthermore, the T-wave inversions just don't look like Wellens' waves (see below). 2. T-Wave inversion in lead III differentiates ACS from PE. If the differential is ACS vs. PE and there are precordial T-wave inversions, then T-wave inversion in lead III is very specific for PE. See Kosuge study below. 3. Most important, tachycardia. Sinus tach is unusual in type I MI. The ECG is not sensitive for PE, but when there are findings such as S1Q3T3 or anterior T-wave inversions, or new RBBB, or sinus tachycardia, then they have a (+) likelihood ratio. S1Q3T3, or even just the T3, may help to differentiate Wellens' from PE. 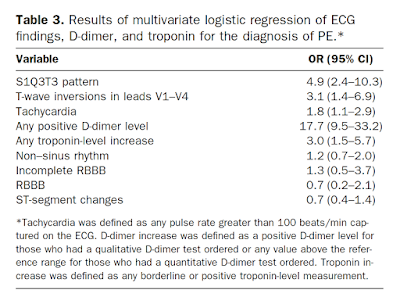 When there is a positive troponin, then the findings are related to myocardial injury, and then PE and MI are at the top of the differential, and Kosuge's article (see below) applies. This is a paper worth reading: Marchik et al. studied ECG findings of PE in 6049 patients, 354 of whom had PE. Just to be clear: these are all patients being evaluated for PE, whereas Kosuge studied those with only ACS and PE left on the differential. We should apply Kosuge's data to our case here because of the positive troponin. Note that tachycardia only has an Odds ratio of 1.8. Remember that is the odds ratio comparing all patients without PE to those with PE. If you did an OR for all patients with ACS vs. those without ACS, it would be far higher. Tachycardia is unusual in ACS unless there is cardiogenic shock or a second simultaneous pathology. In our case here, there is S1Q3T3, precordial T-wave inversions, incomplete RBBB, and tachycardia. All together, that makes for a very high odds ratio. Kosuge et al. showed that, when T-waves are inverted in precordial leads, if they are also inverted in lead III and V1, then pulmonary embolism is far more likely than ACS. In this study, (quote) "negative T waves in leads III and V1 were observed in only 1% of patients with ACS compared with 88% of patients with APE (p less than 0.001). The sensitivity, specificity, positive predictive value, and negative predictive value of this finding for the diagnosis of PE were 88%, 99%, 97%, and 95%, respectively. In conclusion, the presence of negative T waves in both leads III and V1 allows PE to be differentiated simply but accurately from ACS in patients with negative T waves in the precordial leads." Witting et al. looked at consecutive patients with PE, ACS, or neither. They found that only 11% of PE had 1 mm T-wave inversions in both lead III and lead V1, vs. 4.6% of controls. This does not contradict the conclusions of Kosuge et al., who studied a select population of patients who were known to have either PE or ACS. Of those select patients, the ones who also had T-wave inversions in the right precordial leads were studied. 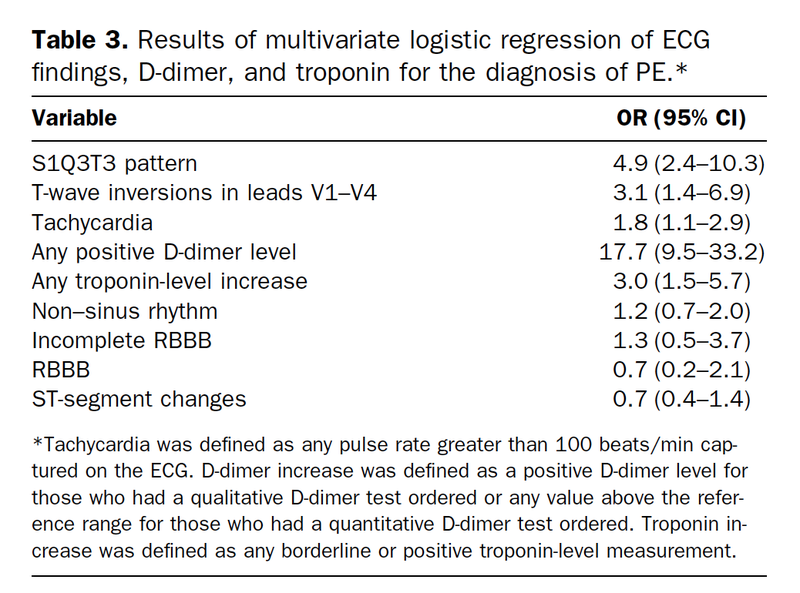 Of these, T-wave inversion in lead III was very specific for PE. In my experience, this is true, but needs validation in a study of similar methodology. Supporting Kosuge, Ferrari found that anterior T-wave inversions were the most common ECG finding in massive PE. Finally, Stein et al. found normal ECGs in only 3 of 50 patients with massive PE, and 9 of 40 with submassive PE. Today, however, that number would be lower because we diagnose more of the submassive PEs that have minimal symptoms. The IRBBB disappeared between the 2 ECGs. The P waves in V1 and V2 suggest that lead placement, too high, falsely generated the IRBBB in the first ECG. The second ECG appears to have proper V1-V2 placement. 100% agree. It looks like that high electrode placement was also hiding the T-wave inversion in V2 on that first ECG. Spectacular discussion. I am proud because I made the Dx based on history and ECG. I would never have made the Dx if I weren't a regular to your blog. I accept 4th year med students frequently for outpatient study and always refer them to your blog. Thanks for the feedback. So glad you and your patients are benefiting from the blog! Great case and superb discussion by Dr. Smith! I was not “getting” acute PE from the brief history reported (the patient had no SOB) — so I considered acute myocarditis as a potential etiology of the new chest pain + ECG changes. I was expecting more anterior T wave inversion with acute PE (though as per Brooks Walsh, some of this may have been the result of improper lead placement … ). That said, as per Dr. Smith — new cardiopulmonary symptoms in a young adult with sinus tachycardia, IRBBB, S1Q3T3 with frank ST coving/T inversion in leads III and aVF should put acute PE at the top of the list of things to rule out. THANKS for presenting!